Kevin is a huge, huge, huge train fan, and unsurprisingly the train gene was not lost on Theo. 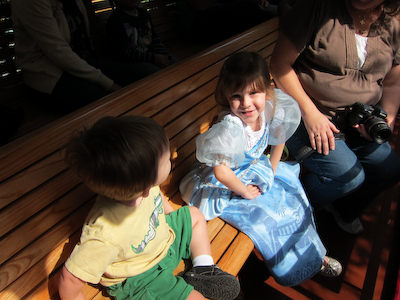 This makes the Disneyland Railroad a constant favorite in our household. The DLRR is a scaled down version of a real railroad. There’s a lot of history to the DLRR, but I’m just going to cut to the chase by summing it up as such: Walt liked trains. He could often be seen in the engine waving to his many fans. When he was alive, of course. There will likely be other DLRR posts, but I’m going to start you off for now. 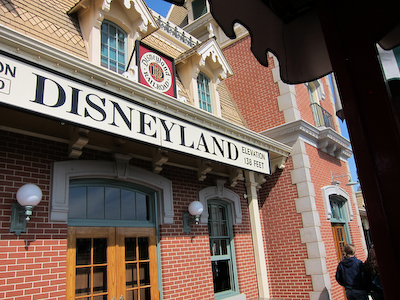 The DLRR has four stations: The Main Street station, which is the iconic station right above Flower Mickey’s head when you walk in, the New Orleans Square station, Mickey’s Toontown station, and the Tomorrowland station.You can get on or off the train at any of these locations, or you can ride the whole loop. 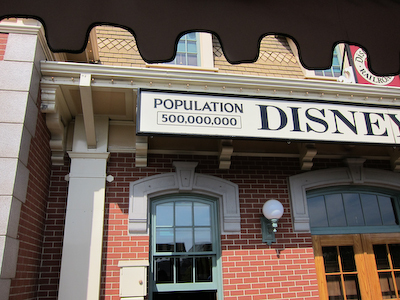 Most people start at the Main Street station, but am I most people? Of course not. 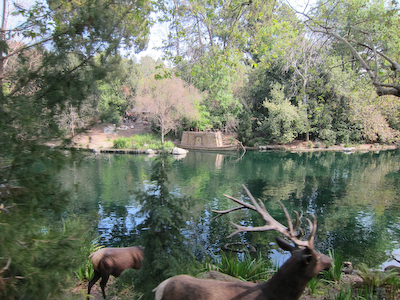 Most people don’t blog about their quest to do everything there is to do at Disneyland. We got on at Toontown station. This happened to be the same visit where we met the Princesses. 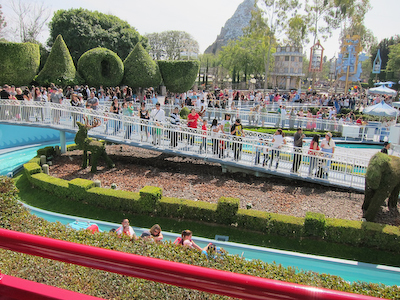 Leaving the Toontown station, you immediately come across the back of Small World. Be sure to wave–people always wave back. Hey, guys closer to the train--the other line is actually slightly shorter! 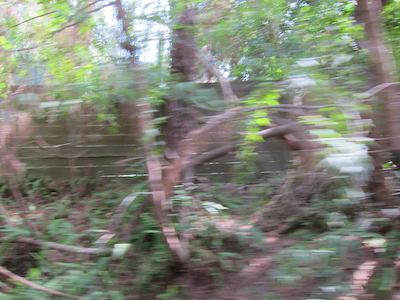 Look, a fence! GET THE CAMERA!!!!! 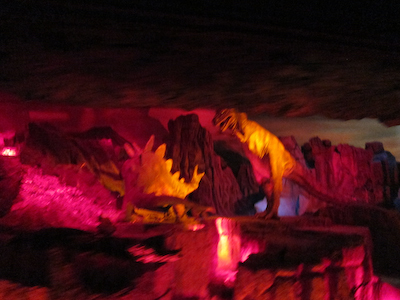 After moving through the Tomorrowland station, which is very forgettable so I didn’t take any pictures of it, but it’s right by Autopia, you get to go through the Grand Canyon/Dinosaur dioramas. First, you hit the Grand Canyon as it is today. 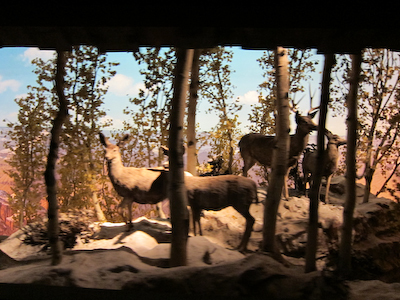 And then, according to the highly trustworthy Wikipedia, some of the animals in the Grand Canyon diorama are actually taxidermied real animals (the only ones in the park). So THAT'S what happened to Bambi's mother! Once you’re all peaceful and one with nature in the Grand Canyon, you get Dinosaur land. It wasn’t a very friendly place. "You are what you eat!" 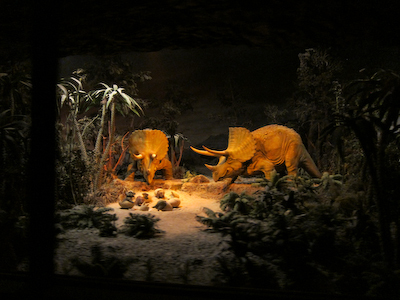 "Dude, it doesn't matter what we eat--we're going extinct anyway"
Are you Team T-Rex or Team Stegosaur? Sadly, we’ll never know how that turned out. Well, we do. In the end, everyone lost. Following the dioramas, you end up at Main Street station. Now this is a really cool station so if you’re going to take the DLRR, it’s a great place to start. I'm not sure if this is the exact elevation of the DLRR either. 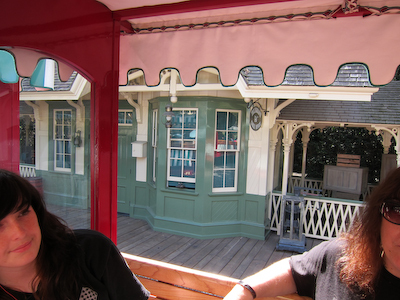 There’s a telegraph office on the south side of the train at Main Street station. Sharp-eyed MYWTMouseketeer Marce correctly identified the location of the telegraph office at New Orleans Square. (I meant to do that. No, I’m just kind of lame sometimes) It’s constantly clicking, which makes you wonder how anyone could sit in a chair and decode Morse code all day. My friend Kelli tells me that the message being clicked out is actually Walt Disney’s speech from Disneyland’s opening day. That’s kind of cool. 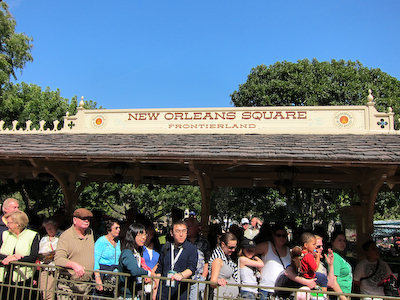 After Main Street is the New Orleans Square stop. The only thing I found surprising about this is that New Orleans Square is apparently part of Frontierland, which means that Frontierland must actually sweep around and enclose Adventureland. Okay, it was interesting to ME anyway. There is really nothing at all interesting in this picture. 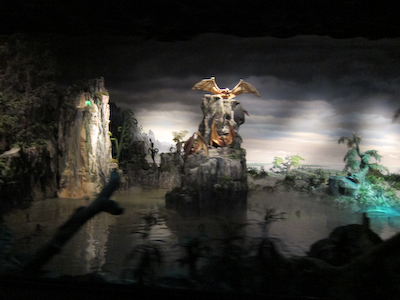 From the New Orleans station, you go through the inside of Splash Mountain. It’s actually quite cool and I would have taken a picture for you, but Splash Mountain is currently closed, so you’re going to have to settle for this very boring picture of the Rivers of America instead. 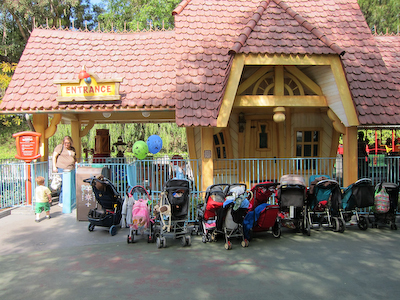 Following THAT, you end up back in Toontown, which was where we left our stroller. 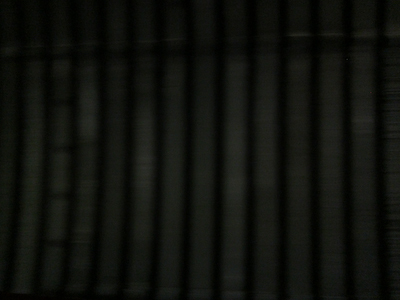 The DLRR takes approximately 20 minutes to ride the loop. It’s a great way to see the park, get from one side of the park to another without walking your feet off, and just take a break and let your train-obsessed toddler feel special. I love it! Princess Katie’s mom, Kelli, turned me onto your blog. Having grown up (with Kelli as my sister’s BFF) near Disneyland and now living on the East Coast, I miss Disneyland and sooooo took it for granted! 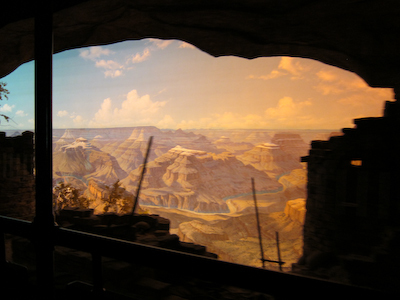 We’ll be back in 2012 when Cars Land is done – until then, many visits to WDW to tide us over. Thanks for the laughs and I love your badass pics. PS: Love the captions! Hilarious! Just had to chime in about your photo of the It’s Small World line. It makes sense that the line closest to the train would be longer because it winds around the canal BUT it is actually the faster line because the other line caters to the wheelchair crowd. Those boats equipped to hold wheelchairs only load on one side, they hold fewer people and it takes quite a bit of time to get the chairs on and off, thus slowing the line quite a bit at times.